Washington (CNN) - Former Alaska Gov. 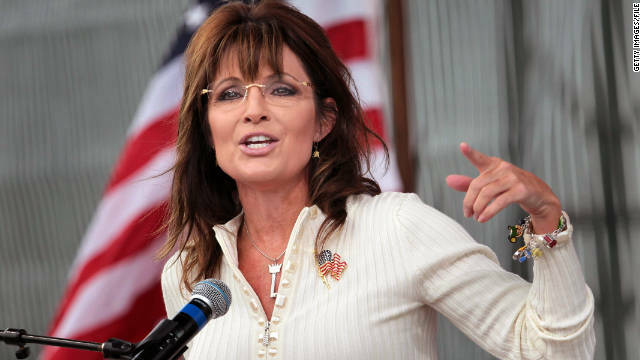 Sarah Palin said she would be "disappointed" in the American electorate if Hillary Clinton becomes a serious candidate for president in 2016. The 2008 GOP vice presidential nominee argued Clinton would not be right for the role as commander in chief after four Americans, including the U.S. ambassador to Libya, died last year in a terrorist attack against a U.S. consulate in Benghazi. "If (Benghazi) doesn't have an impact on the 2016 presidential election, if she is a candidate, then America, I am very disappointed in our electorate," Palin said Sunday on Fox News, where she's a contributor. She said "anyone who would just throw away 200 years of military ethos and leave our men behind to be murdered" should "never be considered as a commander in chief." The lack of security at the consulate and the September 11, 2012 attack are poised to be a major point of contention by Republicans if Clinton decides to run for president. Clinton ultimately took responsibility for diplomats' safety, and was grilled before two congressional committees in January. At one point she lost her temper while responding to questions from Sen. Ron Johnson, R-Wisconsin. He was asking her about the erroneous, initial talking points that claimed the attack stemmed from a spontaneous protest against an anti-Islam video, though the administration later defined it as a terrorist attack and said a protest never happened. "What difference at this point does it make?" Clinton responded. "It is our job to figure out what happened and do everything we can to prevent it from ever happening again, senator." The attack on Benghazi is still a matter of congressional investigation by House Republicans. "That's why I'm so grateful for Congress to be pursuing what happened in Benghazi," Palin said. "Because at this point, it still makes a difference what happens in Benghazi." "Anyone who doesn't understand that and dismisses it as being indifferent, they should not be our commander in chief," she continued. For her part, Clinton said in a recent interview with New York Magazine that she is in no hurry to decide about a potential 2016 bid for the White House, saying it is a decision "not to be made lightly." Asked how she plans to combat any conflicts she may face related to her political legacy, she said the best course is to "find common ground." "I have a lot of reason to believe, as we saw in the 2012 election, most Americans don't agree with the extremists on any side of an issue," Clinton said in the interview. "But there needs to continue to be an effort to find common ground, or even take it to higher ground on behalf of the future." Palin's comments mark a stark contrast to high praise Clinton received Sunday from House Democratic Leader Nancy Pelosi, who said if Clinton decides to run, "she will win." "And when she becomes president, she'll be one of the best-equipped, best-prepared people to enter the White House in a very long time," Pelosi said on CNN's "State of the Union." Noting Clinton's experience as secretary of state, as a U.S. senator from New York and as a first lady, Pelosi said Clinton would be "more prepared than President Obama; certainly more prepared than President Bush; certainly more prepared than President Clinton I might admit." Palin/Bachman 2016 ... in SOMALIA! If I were a republican, I would tell Palin to get her gun and go moose hunting and leave politics for those who know something about it. I don't know why she thinks she should enter any political discussion when she knows nothing about it. One thing she is good at is to stir up hate and divisiveness. There is enough hate going around without her putting her two bit in. So glad Sarah will never be President!! stand it, Have you though about going back to school, get a degree in Political Science for a start? Well, if anyone would know about being unqualified it would be Sarah! Sarah Palin thanks for giving Tina Fey a job. The Palin haters are fools. She's spot on as per usual. STOP HILLARY. Ok so Sarah Palin's logic is that anyone who is killed by a terrorist attack died because the secretary of state and president didn't provide adequate protection. Ok. So what happened on September 11 2001, Ms Palin? Was America not attacked on its home soil leading to the deaths of thousands of American citizens? Why isn't the secretary of state responsable for that attack? How did the president of the time allow such an attack to take place? Shouldn't they take the responsability for those deaths? Who knew about the attack and when? Did President Bush sit in a schoolroom and finish a story book AFTER he was told about the attacks? Palin is great at twisting fact and passing blame. She would be a TERRIBLE president. Hillary will be a FANTASTIC president. "Because at this point, it still makes a difference what happens in Benghazi." "Anyone who doesn't understand that and dismisses it as being indifferent, they should not be our commander in chief,"
Dumb dumb, DUMB!!! Hillary did NOT say it doesn't make a difference what happens in Benghazi!!!! She said it doesn't make a difference if at first they thought the attack was due to the anti-Islam movie, and not a planned terrorist attack. The attack itself is not what she's talking about, you stupid, stupid, crazy woman. EI disagree totally with that chicken-head sarah palin, what happened in benghazi was a tradjedy and these clueless republicans r using it as a political tool, a majority of Americans understand no one is to blame for what happened except those radical extremists who continue to attack innocent people who dont agree with their religion, there have been worst attacks than benghazi(WTC bombing) and there was no blame for that, republicans need to get their head out of their asses, including sarah palin!!!! we have one idiot in the W/H, in Hillary we don't want another. I am no fan of Clinton but maybe someone else should be denouncing her as unfit to be president (which i think she is). For Palin to be making the charge brings to mind the whole pot and kettle thing. As if anybody with a functioning brain still listens to Sarah Palin. There was a humor factor to listening to her before but now she's simply a disgraced clown and as annoying a public figure as we've got. No, I didn't and will not purposely read anything attributed to this talking rock. The media looks as empty and shallow giving her the time of day as she does flapping her gums. What an idiot. We said the same thing about you and we were right. At least she does not need to write on her hand for interviews. What a moron. Go back to AK.